We always strive to provide the best in Website Design, Ecommerce, SEO and Search Marketing to our customers. Take a look at our Customer Testimonials to see what our clients are saying about us. Find out what we’ve been working on lately by checking out our News Blog and Portfolio. Call us at 512-298-1850. 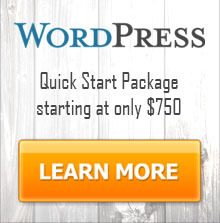 WordPress is the most widely used website framework EVER. Over 30% of the websites in the world are powered by WordPress. What ecommerce solution is best for your business? Let us use our 20+ years of experience to help you make that decision. Inbound marketing is king. When a potential customer is searching, your company needs to be visible. That’s where we come in. Have questions about a new or existing site? Need online marketing advice? Give us a call. We’ll review your current situation, perform a quick analysis and provide honest feedback. Call 512-298-1850. View some of our recent projects. View all projects.